LEGO announced a contest for fans in the United Kingdom, Germany and the United States. The purpose of the contest is to design a stamp that will be included with the holiday catalog. 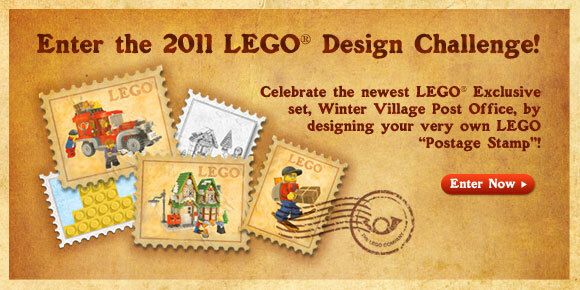 Fifty finalists will win the latest addition to the Winter Village series, 10222 Winter Village Post Office. LEGO is asking consumers ages 6 + to design a LEGO themed postage stamp to be featured in the Late Holiday Catalogue . For each country there will be 50 finalists selected to receive a copy of 10222. 25 will be for ages 6-14 and 25 will be from ages 15 & up. From the 50 finalists, 1 grand prize winner will be selected per country. In addition to a copy of 10222 – Winter Village Post Office, grand prize winners will have their stamp design featured on the late holiday catalog for their country along with a professionally designed and framed LEGO mosaic of their design. When: We will be accepting entries for the contest September 1-30 and selecting the finalists & winners for each country the first week of October. How: Consumers must simply visit shop.LEGO.com/Design-Challenge (Germany: shop.LEGO.com/Designwettbewerb) to download the official entry form. They or their parent/guardian must complete the form and email it along with their stamp design to the email address designated for their country. No purchase is required and there will be no physical entries collected. Why in the fine print does it describe the winter post office as having an approximat value of $50 when it’s $70 on the LEGO website? That’s great, thanks Lego! Not only do you rip off the poor folk down here in Australia by charging us nearly 50% more for the same sets you sell everywhere else in the world (for example, the new USC Super Star destroyer A$699.99 which is US$734.99 BEFORE the ridiculous shipping charge, yet from the US site it’s US$399.99!!! ), but you thumb your nose at us further by not including us in your competitions.